''Myself and group of friends arrange an annual weekend away riding on the Continent. In an act of previously unknown self-awareness the weekend has become known as the Tour De Mid Life Crisis. This years TDMLC took us to Swiss Alps. Lausanne to Speiz via Jaunpass. 113km. The shine was taken off day one by the non-arrival two team members bikes. No thanks at all to the frankly p*ss poor service by BA’s Baggage ‘department’. Our Lausanne based riders (Gibbs and Abbott) rode the stage while our UK contingent (Steel & Townsend) fannied around between our hotel and Geneva airport tracking down our rides. Once the bikes were secured it was too late to make the stage so we trained to Speiz. Abbott just nicked the stage from Gibbs. 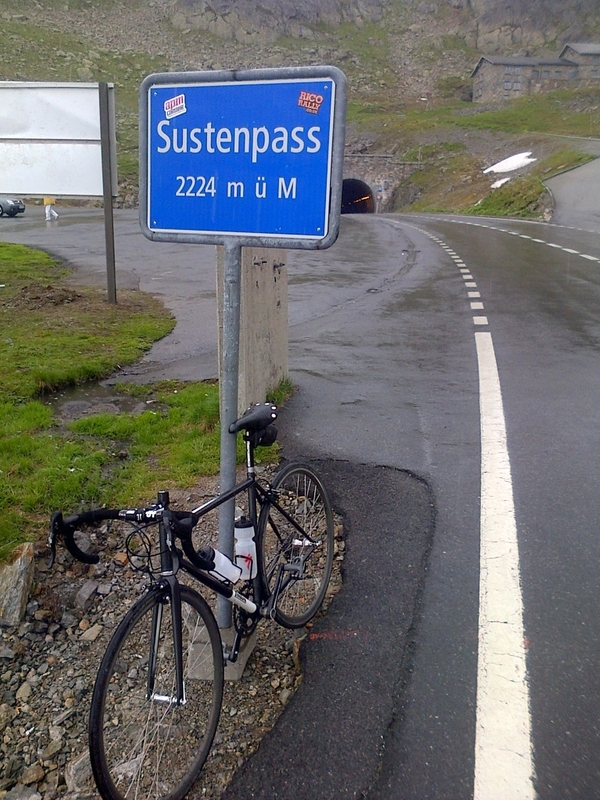 Speiz to Wassen via Sustenpass. 99km. A weather forecast of rain from 1pm forced an early start from Speiz. A sharp pull out of the hotel nearly caused a repeat of my infamous Gospel Pass Breakfast Vomiting Incident of 2004. The older I get the longer it takes for my old diesel engine to warm up before any kind of decent climb. If I don’t get 15-20k in my legs before the road starts to go up I can really struggle. Once over that bump we cover the fairly flat 50k up to the Susten in decent time. UCI DG Martin Gibbs wins the cake off at our brief stop in Meiringen. Then it’s onto the Susten. What a monster. 27k of UP. In baking sunshine. But what a glorious lump of rock. There are no crazy sections but it’s so long the relentless gradient really takes its toll. I blow up at about km 22 and the final hairpins are an awful, awful grind. It’s the first time in years I’ve just wanted to get off and stop (and cry). Just to improve my mood the weather goes to pieces 1k from the summit and it starts to rain. As the weather closes in and my exhaustion worsens the stretch known as ‘Heavens Curve’ looks more like a Cornish clay tip. By the time I’ve taken a snap of the Donhou at the top it’s lashing down. There is still a decent volume of snow by the road. The 18k descent that I’d been so looking forward to becomes a ride of attrition: hooning rain, freezing cold, awful visibility and the prospect of locking up my brakes on a p*ss wet road. Within five minutes I’m soaked to the skin and I can barely feel my fingers. It’s the coldest I’ve ever felt on a bike. Halfway down and I’m muttering ‘just need some sun’ in an endless repetitive mantra to try to keep myself focussed. There’s nothing I can do – just hold on and hope it warms up as I get lower down the mountain. I finally wobble my way into Wassen, find the café where the rest of the squad are and … can’t get off my bike. My whole body feels like it has seized up. When I finally manage to get extricate myself and order some food (truly the best bowl of soup I’ve ever tasted) it takes me almost a full half hour to stop shaking from the cold. Gibbs takes the stage. Wassen to Zurich via Rotehthurn. 105km. Day Three dawns with the sound of solid rain outside the window. The clouds are just above our heads as we roll out of Wassen. The descent down into the valley is cold and wet. On a clear day this would be a brilliant 15k roll down the hill. Today it is, well, bloody horrible. Once we get to the valley floor the rain becomes even more intense and we run into a headwind. The next 20k are a hard grind into Brummen. The train station in Altdorf is looked at with longing and there is almost a mutiny. Once in Brummen we break for pastry (The Tour De Mid Life Crisis – powered by strudel) and decide that another 60k up to 1200m into Zurich in this weather might be just a step too far. An alternative 40k route into Lucerne is proposed. Which turns out to be a masterstroke – the first 25k is a flat road that runs alongside the lake. Technical enough to maintain interest, protected from the wind and with minimal traffic it turns into a four man team time trial and we bang through the km’s in no time at all. One of my favourite pieces of riding ever. The rain even eases off for a short while. 15k of mucking around on cycle paths alongside a nasty main road and we are almost home. An audacious attack on the final rise into Lucerne nabs me the stage and very quickly we are on the train back to Lausanne. Its only when I get back to our hotel and into the shower that I realise that 80k in constant rain in unwashed shorts has resulted in me wearing two Boonen-esque extra holes in my a*se along the pad line of my shorts. Explaining to a non -English speaking pharmacy assistant that you need antiseptic cream for your battered, weeping, back-end is a life experience everyone should have. The moral of the story – always wash your bibs no matter how tired you are. All in all a fantastic weekend. Great roads, minimal traffic, cracking strudel. The Susten is a beautiful pass is a real test of your endurance. Highly recommended. It doesn’t hold the cachet of some of the classic French alpine passes but it is more than match for any that I have ridden. That pro-riders may go over this monster and THEN up the Grimsel or the Furka only increases my admiration for their incredible athletic ability. Thanks to Mark Wheatley for kit transfer, Nicky Gibbs for the pasta party, Box My Wheels for the bikebox, Alain Rumpf for the route. No thanks to BA Terminal 5. Any caption suggestions for the above? !